Ganesha (Sanskrit: गणेश), also spelled Ganesa or Ganesh, also known as Ganapati (Sanskrit: गणपति), Vinayaka (Sanskrit: विनायक), and Pillaiyar, is one of the deities best-known and most widely worshipped in the Hindu pantheon. His image is found throughout India, Sri Lanka and Nepal. Hindu sects worship him regardless of affiliations. Devotion to Ganesha is widely diffused and extends to Jains, Buddhists, and beyond India. 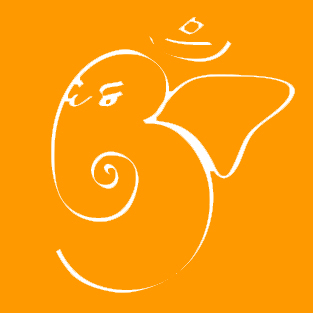 Ganesha has many other titles and epithets, including Ganapati and Vigneshvara. The Hindu title of respect Shri (Sanskrit: श्री; also spelled Sri or Shree) is often added before his name. 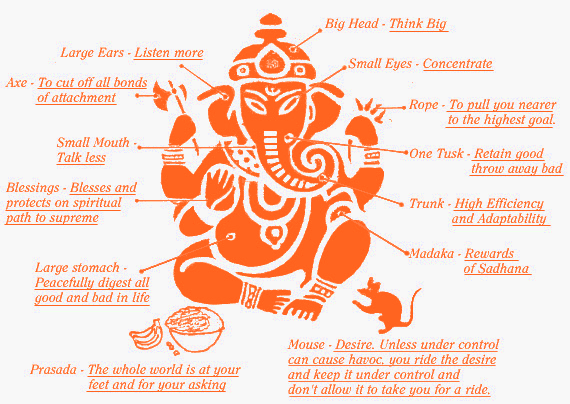 One popular way Ganesha is worshipped is by chanting a Ganesha Sahasranama, a litany of “a thousand names of Ganesha”. Each name in the sahasranama conveys a different meaning and symbolises a different aspect of Ganesha. Although he is known by many other attributes, Ganesha’s elephant head makes him easy to identify. Ganesha is widely revered as the Remover of Obstacles and more generally as Lord of Beginnings and Lord of Obstacles Vighnesha (Sanskrit: विघ्नेश), Vighneshvara (Sanskrit: विघ्नेश्वर), patron of arts and sciences, and the deva of intellect and wisdom. He is honoured at the beginning of rituals and ceremonies and invoked as Patron of Letters during writing sessions. Several texts relate mythological anecdotes associated with his birth and exploits and explain his distinct iconography. Ganesha’s head symbolizes the Atman or the soul, which is the ultimate supreme reality of human existence, and his human body signifies Maya or the earthly existence of human beings. In his upper right hand Ganesha holds a goad, which helps him propel mankind forward on the eternal path and remove obstacles from the way. The noose in Ganesha’s left hand is a gentle implement to capture all difficulties. The elephant trunk represents the Hindu mantra Aum (ॐ, also called Om), the sound symbol of cosmic reality. The term oṃkārasvarūpa (Aum is his form), when identified with Ganesha, refers to the notion that he personifies the primal sound.